Are you ready to join the Dark Side? Star Wars: Battlefront is a series of video games based on the Star Wars film franchise. 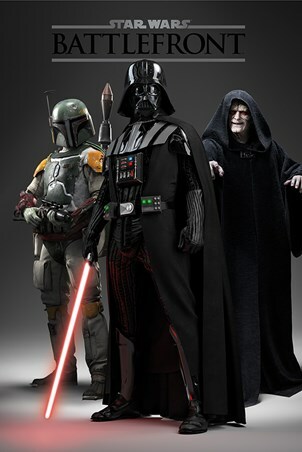 Players can take the role of the Rebel Alliance or the Galactic Empire to compete against each other in various locations within the Star Wars galaxy. 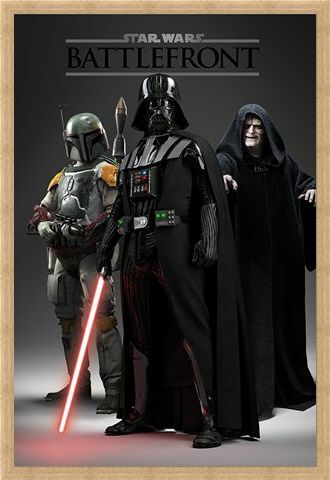 This poster features the characters Palpatine, the formidable emperor of the Galactic Empire, Darth Vader, his corrupted right-hand man and Boba Fett, the bounty hunter. With these 3 striking a menacing pose and the Star Wars logo printed above, this would make the perfect gift for any Star Wars fanatic. High quality, framed The Dark Side, Star Wars Battlefront poster with a bespoke frame by our custom framing service.